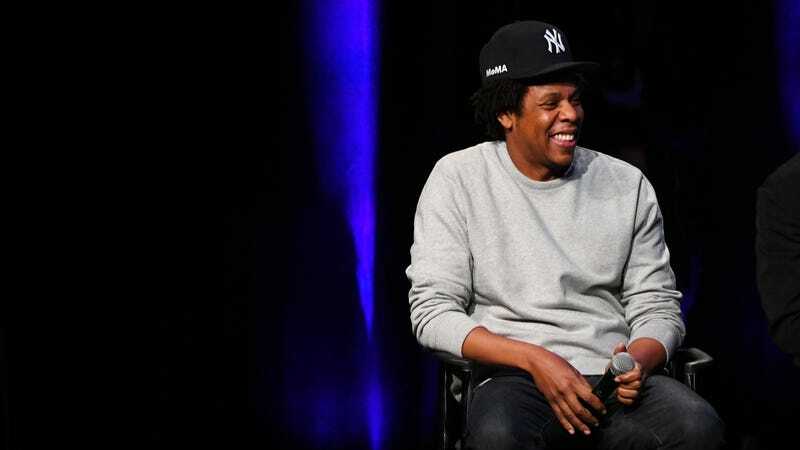 Shawn ‘Jay-Z’ Carter speaks onstage during the launch of The Reform Alliance at John Jay College on January 23, 2019 in New York City. Jay-Z just scored a legal win relevant to arbitration proceedings everywhere. Page Six reports that the rapper and mogul, also known as Shawn Carter, has won a suit against the American Arbitration Association which charged that its “too white” panel was unqualified to give a fair, unbiased ruling on the trademark infringement suit brought against him by apparel company Iconix. At issue: Iconix, who purchased Carter’s Rocawear in 2007, subsequently sued the mogul in 2016, claiming a hat deal he’d struck with Major League Baseball violated their licensing agreement. Carter then filed a Manhattan Supreme Court suit against the AAA, arguing that as a minority business owner, he and others like him were entitled to select from an arbitration pool that “reflects the diverse population,” and that his inability to do so deprived black litigants like himself of “the equal protection of the laws.” Carter also charged that despite the association’s claim that its membership is “composed of 24 percent women and minorities,” he could identify only one Asian-American, one South Asian, and one Latino representative. The AAA later identified three black arbitrators, but one was unable to serve on the case due to a conflict of interest. Carter scoffed at the meager number of qualified members by leveling that a “token number of African-Americans” violates public policy. However, issues of potential prejudice are customarily addressed by attorneys in the jury selection process commonly known as voir dire, and apparently, a judge agreed with Carter’s similar concerns about the potential biases of his original arbitration panel. Six black candidates have now been presented by the AAA to resolve the trademark dispute. But now, Carter is asking that the case be discontinued, due to the fact that the first of those candidates was AAA Senior Vice President Harold Coleman, who is African-American, according to new court papers presented by Carter’s lawyer, Alex Spiro, who says the AAA later presented five more black arbitrators as options. A spokeswoman for the AAA did not immediately comment to Page Six on the latest developments of the suit, but the AAA has reportedly also promised to consider 11 black candidates proposed by Carter for its “Large and Complex Cases” roster.